One can only marvel at Birds Of America, the new one from Lake Ruth. The record, out on Friday officially, is a huge leap forward from the band's 2016 offering Actual Entity, an album that was itself something of a chamber-pop masterpiece. Birds Of America, quite simply, sees Lake Ruth offer up their best release to date. I suppose one could still trot out a few Broadcast references when describing the sound of Lake Ruth but, really, a tune like "Julia's Call" is so bright and direct that it feels less a nod to an obvious inspiration point and more like a strong bit of songwriting from a trio using a near-classicist approach. The members here -- multi-instrumentalist Hewson Chen (The New Lines), drummer Matt Schulz (SAVAK), and vocalist Allison Brice -- sound so confident here that one is a bit surprised at how direct "One Of Your Own" is, all rippling keyboard lines and supple hooks bouncing under Brice's soaring vocals. Elsewhere, the near-jazzy "Radiant City" sees the group pursue more down-tempo pleasures, Schulz's drumming here being especially impressive as he and the players shift genres with ease, while the more precise and propulsive title cut allows the band to venture into the sort of territory once mapped out by Stereolab on their earliest releases. Brice's vocals here are especially marvelous, and, if anything, the entire album sounds more like the work of a group this time around than a bunch of superb players, as on previous releases. From the retro-trippyness of "VV" and on to the Cardigans-recalling "Westway", Birds Of America is a thing of beauty, and the sort of shimmering indie-pop that is rarely found anymore these days. Fans of Laetitia Sadier and The Clientele, for instance, should find lots to love here. 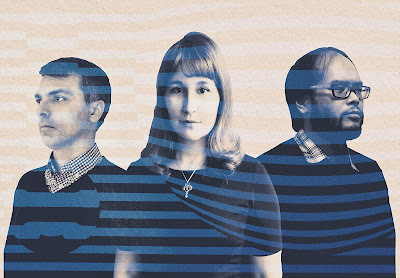 Elegant and unpretentious, the chamber pop of Lake Ruth is gorgeous, glittering stuff. If previous Lake Ruth offerings seemed almost as concerned with the production and instrumental flourishes as the compositions themselves, Birds Of America is wonderfully straightforward in its presentation of a set of great songs. The strengths of the players and vocalist are being used to great effect here, thanks in part to the production from Geoff Sanoff, and a listener can't help but think that Lake Ruth sound more confident here than they ever have before. That assured command of the material makes Birds Of America a fantastic record, and easily the most enjoyable Lake Ruth release to date. Birds Of America by Lake Ruth is available via the link below. More details on Lake Ruth via the band's official Facebook page.